A Chinook helicopter carrying a total of 38 people was apparently shot down by insurgents. Reports say that 31 people were killed including 25 U.S. Navy Seals. Some of those Seals were on the team that killed Osama bin Laden in May, 2011. While the Taliban is claiming responsibility, NATO says that the cause of the crash is not known. News outlets have written that a U.S. official, speaking anonymously as he was not authorized to discuss the matter, said the aircraft was most likely brought down by a rocket-propelled grenade. The 31 U.S. soldiers killed represent the highest number of American casualties killed in a single incident in the decade-long war in Afghanistan. This incident occurred in the Sayd Abad district of Afghanistan’s Wardak province, a restive area that borders the country’s capital Kabul. President Karzai released a statement expressing sympathy to President Obama and extending his "deep condolences" to the American president. Chinook helicopters are apparently vulnerable to attacks by rocket-propelled grenades and machine gun fire, especially when landing and taking off. They are big targets which fly low to the ground. It is reported that the U.S. typically flies at night when there isn’t much illumination. These helicopters are an important means of transporting troops and resupplying outposts in mountainous regions where ground transportation may be slow and or dangerous. The deadliest helicopter crash involving U.S. Special Forces in Afghanistan occurred in June 2005, when insurgents shot down a Chinook in Konar province, near the Korengal Valley. Sixteen U.S. troops, most of them Army Rangers, died. The Rangers were flying into the valley to rescue a small team of Navy SEALs that had come under fire. The Taliban claims to have shot down a NATO helicopter, killing 31 US special forces troops and seven Afghans. It is the worst single loss of life for the United States since they entered Afghanistan nearly a decade ago. Nato has only confirmed "there was enemy activity" in Wardak province, west of the capital Kabul. But Afghan officials and eyewitnesses say insurgents were behind the attack. It is believed the helicopter was a Chinook, commonly used by coalition forces in Afghanistan to ferry troops in and out of combat…. A helicopter crash in Afghanistan killed 31 Americans, including as many as 25 Navy SEALs in one of the worst single-day U.S. losses of life since the war began, a senior military official told ABC News early this morning. A total of 38 people were on board the Chinook helicopter when it crashed overnight in the eastern Afghan province of Wardak. Initial reports indicate up to 25 Navy SEALs were on the aircraft at the time. On August 6, 2011, a NATO-led ISAF Boeing CH-47 Chinook helicopter crashed in a district of Wardak province, west of Kabul, killing 25 US Navy’s US Special Forces’ Navy SEALS, five crew members, an interpreter, 7 Afghan National Army special operations soldiers and a mongrel dog. Military officials, speaking on the conditions of anonymity, have said the helicopter was shot down by the Taliban using a rocket-propelled grenade. 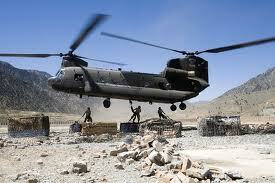 The Boeing CH-47 Chinook is an American twin-engine, tandem rotor heavy-lift helicopter. Its top speed of 170 knots (196 mph, 315 km/h) was faster than contemporary utility and attack helicopters of the 1960s. It is one of the few aircraft of that era, such as the C-130 Hercules and the UH-1 Iroquois, that is still in production and front line service with over 1,179 built to date. Its primary roles include troop movement, artillery emplacement and battlefield resupply. It has a wide loading ramp at the rear of the fuselage and three external-cargo hooks.